Jim is a partner in the firm where his duties have included managing partner. Jim has an extensive civil trial practice. An experienced litigator, Jim has tried several hundred jury cases to a verdict. He represents clients in both state and federal court in jury and non-jury matters throughout South Carolina with his primary emphasis being the representation of insurance companies and their insureds, businesses and individuals. Over the years, Jim has been a speaker at continuing legal education seminars and has conducted a variety of insurance and litigation seminars for clients and other organizations. In 1997, Jim was elected as an Advocate to the American Board of Trial Advocates (ABOTA), a national organization whose membership is limited to the country’s most experienced plaintiff and defendant trial attorneys. 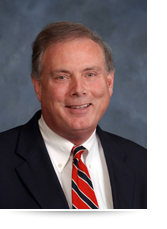 In 2001, he was certified as a mediator and arbitrator by the South Carolina Supreme Court and has served as a mediator and arbitrator in numerous cases. He is an adjunct faculty member at the University of South Carolina School of Law teaching civil litigation. Jim was born in Union, South Carolina and grew up in Clinton, South Carolina where he attended the Laurens County public schools.